How Can You Make a Good Salad? To make a good salad, use fresh-cut greens, wash and dry them carefully, make a dressing and toss with your hands or with salad tossers. Optionally, you can add embellishments such as nuts or cheese. Start by choosing the type of greens to be used, such as romaine, spinach, arugula, radicchio or endive. Get the freshest greens possible, choosing ones that look like they were just-picked. Submerge the lettuce leaves in a large bowl of cold water. Repeat with fresh water until the water comes out clean. Dry the wet greens with clean paper towels or in a salad spinner. Be gentle when handling the leaves. The two basic types of salad dressings are vinaigrette and creamy dressings. Vinaigrette consists of a combination of oil and an acidic liquid such as vinegar or lemon juice. Creamy dressings are often made with a mayonnaise base. Various flavorings can be added to these dressings, such as garlic, mustard or herbs. Salt and sweeten to taste. 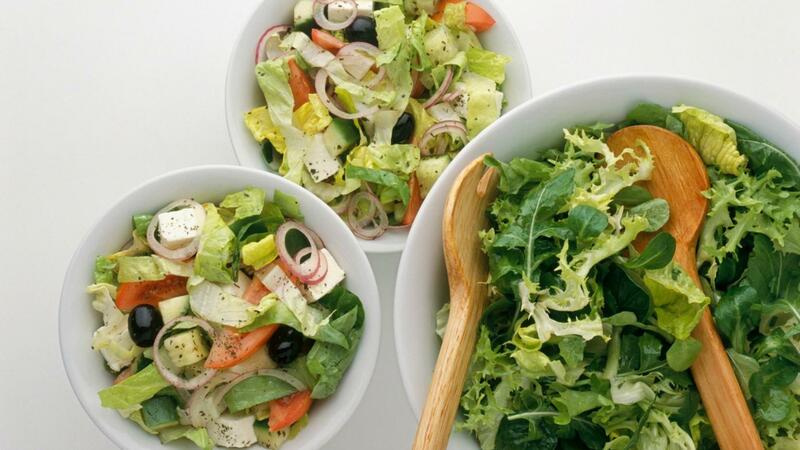 Toss the salad gently but thoroughly by using your clean hands or two large utensils. Make sure the greens are well coated with dressing. Other ingredients that may be added are onions, chopped tomatoes, hard-boiled eggs, mushrooms or olives. Serve the salad immediately while it is fresh. What Are Some Good Salad Recipes? How Do You Make Spinach Salad? What Is in an Antipasto Salad? What Is a Simple Crab Salad Recipe?